Engineering analyses by the project design team indicated that construction of proposed tanks and buildings would occur due to the presence of soft compressible soils to depths of up to 40 feet. The engineer evaluated either using deep foundation support or improving the soil by surcharging and wick drains. The engineer determined that surcharging and wick drains and then using shallow foundation support would be much less expensive than deep foundation support. Wick drains were installed at the site to accelerate the consolidation of the soils under the surcharge loads. 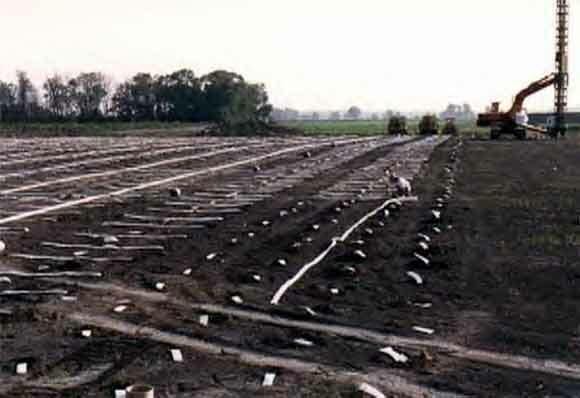 To provide atmospheric relief and surface drainage for the wick drains, horizontal strip drains were used.